Here you can learn about stelling and bending, and how to get there. 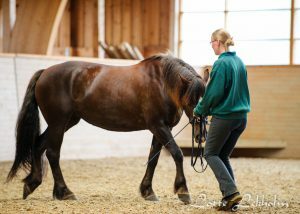 By working on stelling and bending you get the horse to carry itself properly, building muscles to be able to carry both itself and the rider in a healthy way. The foundation of all dressage training is bending and stelling. Stelling occurs in the neck, when the mandible is bent under the wing of the atlas vertebrae (the first neck vertebrae). 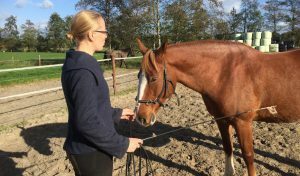 Bending is when the entire body of the horse bends smoothly and the vertebrae, from the neck to the tail, gently settles like beads on a string in a mild c-curve. Before you may even think about asking for stelling and bending you have to teach the horse to lower its head. 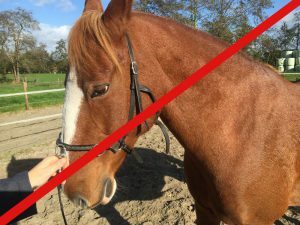 Ask the horse to lower its head by a lightly squeezing the cavesson rein, to create a small pressure on the neck. As soon as the horse yields to the slightest of pressure, totally release and praise your horse. Over time, you may ask your horse to lower its head more and more, and for longer periods of time. A very easy way of making the horse understand to lower its head is to use candy. As soon as the horse yields to the slightest of pressure, totally release and praise your horse. When the horse begins to understand to lower its head you start working on stelling. Lower the head enough to release the under neck. Then you want it to open up the area between the mandible and the wing of the atlas vertebrae, ie. you want it to stretch its nose forwards. Only then it is possible to ask for stelling, because only then there is room for the mandible to turn under the wing of the atlas vertebrae. Stelling takes place in the neck of the horse, when the mandible is rotated in under the wing of the atlas vertebrae. For stelling of the neck the area between the mandible and the wing of the atlas vertebrae (marked white in the lower image ) must first be opened. Here the neck of the horse is compressed and the underneck is visible. This is wrong and will never lead to a proper stelling. To correct it the head must be taken forwards to open up the area between the mandible and the atlas vertebrae. Bending takes place through the whole body of the horse, from neck to tail. 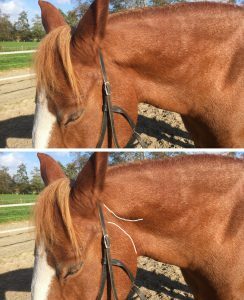 If the horse is supple, stelling of the neck propagates to the hip, and the inner hip will drop a bit forward down. From the stelling you can go further into bending, and you simply ask for a bit more and activate the whole body. Unfortunately, not all our horses are so supple that they just move with us when we ask for more, but you may notice there is a stop on the way towards the hip. There are different types of tensions and we want to supple these by our training. However, you cannot pull and “force” the horse to bend but ask softly for a little more bending each day. Think about how uncomfortable it is if someone pulls your head. It is equally unpleasant for the horse! When the horse is carrying correctly, it is also in stelling and bending. This work is in the beginning most easily done in walk on a circle in ground work, since the bent circle track helps the horse to find its own bending. This means the inner hip goes forward down when the horse steps forward with the inner hindleg. To fit the inner hindleg under the belly, the belly rotates outwards, i.e. the rider feels the inner side of the back of the horse is lowered whereas the outside of the back is raised. The body of the horse bends, and the inside gets shorter whereas the outside is stretched and extended. Since the inner hindleg steps towards the centre of gravity and lifts the entire heavy chest, the outer frontleg will become free and moveable. Stelling takes place in the neck when the mandible in rotated in under the wing of the atlas vertebrae. For a correct stelling, the nose must be taken forward to open up the area between the mandible and the atlas vertebrae. When the horse carries itself the inner hip moves forward down, the chest rotates outwards and is lifted by the hindlegs, which leads to a free outer shoulder.